For a while now, I've been fascinated with the concept of "creativity". What is it? Where does it come from? Why do we say one person is creative, and another isn't? There's a lot of research out there if you go looking. Tonight, I read one blog that talked about something called "brainswarming" which encourages groups to think vertically and laterally about problems. This is not done in a typical "brainstorming" session in a room, but in an open area where people are free to contribute ideas without others being present to weigh in on them. 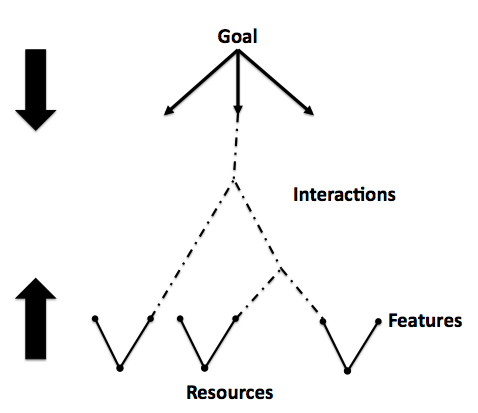 The idea is to define a problem "goal" (what you want to happen) at the top of the chart and the available resources you have at the bottom. Then you start identifying the features those resources have. Then look at interactions between those features to try to find a solution to a problem. They show one example, which is how the crew of the Titanic might have used resources on the boat to save more of the passengers. 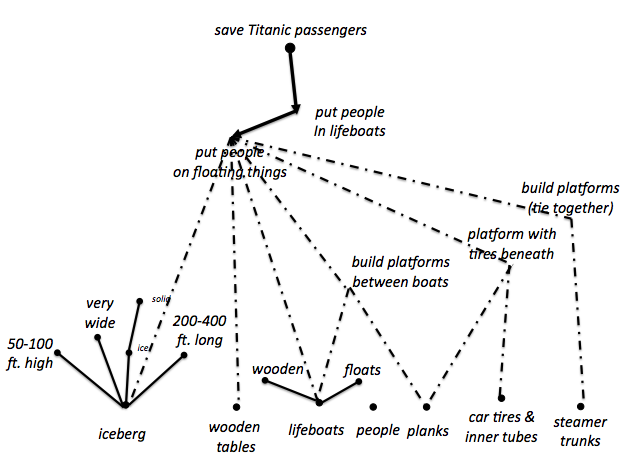 In the above example, we see at the bottom various resources that the people brainstorming this problem identified on the Titanic that might have helped. Just above that, we see some of their interactions or links between resources, like linking wooden planks from the ship with lifeboats to create platforms between lifeboats that people might have been able to sit on, or using the planks with tires from the cars to built flotation devices. You might even have been able to get people up on the iceberg itself. It's an interesting problem-solving approach.